May 7, 2017 – Day 179 P.E. By a vote of 217 to 214, with 0 Democrats voting in favor, RepubliCare rose from the dead. 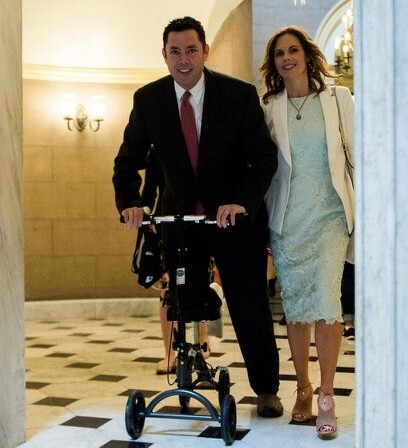 The aye vote included that of terrible person Rep. Jason Chaffetz (R-UT) who scooted himself to the vote from the hospital where he had surgery on an old ankle injury, a pre-existing condition. This new version of RepubliCare takes everything you hated in the first version(e.g., gutting Medicaid, punishing the poor and sick, ensuring higher premiums for those over 50, providing huge tax cuts for the very rich) and added an amendment to make it crueler by allowing states to eliminate protections for people with pre-existing conditions. 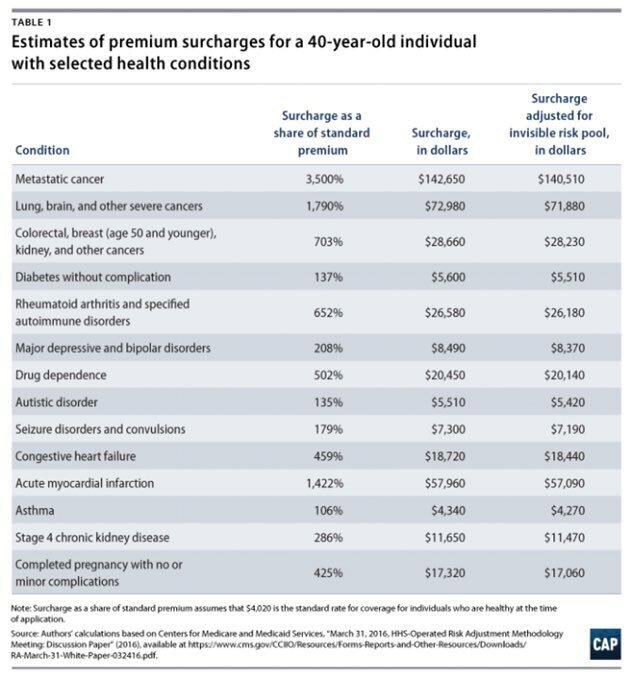 If they had bothered to read it, the GOP might have learned that this bill takes money away from special education students, allow large employers to offer low quality insurance, and raise premiums for those with pre-existing conditions by, in some cases, over 1000%. If the California GOP representatives, all of whom voted for it, had read it they would know that the refundable tax credits that will replace Obamacare subsidies are not usable in California because these tax credits cannot be used on any health care plan that covers abortion. No, I didn’t say they couldn’t be used to pay for abortion. The tax credits are ineligible for a plan that even covers abortion. California requires that all plans to cover abortion. Others did read the bill. That’s why the American Medical Association, AARP, American Hospital Association, American Cancer Society, National Physicians Alliance, Catholic Health Association, the Cystic Fibrosis Foundation, and many health care organizations all oppose it. A poll on the prior, less evil, version in March, put the percentage of public support at 17%. As Senator Al Franken (D-MN) pointed out that’s 1 percentage point less than the number of people who believe in ghosts. 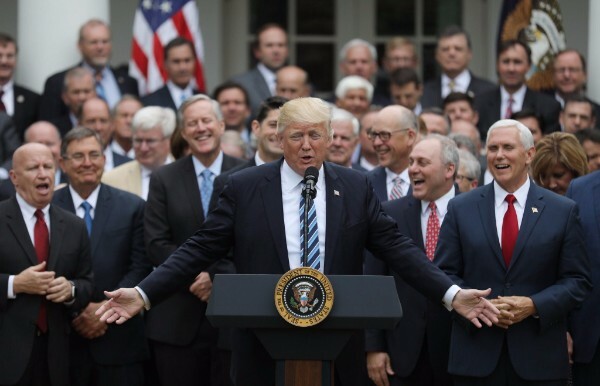 To celebrate voting to transfer close to $1 trillion from the poorest Americans to the top 2%, the House Republicans immediately gathered to chug Bud Light and take selfies on the White House lawn (picture below). Apparently never having seen Schoolhouse Rock about how a bill becomes a law, House Republicans and Trump nearly took out W.’s “Mission Accomplished” banner. Thankfully, we’re far from the finish line. The bill heads to a skeptical Senate, which will certainly rewrite it over the coming months and return it to the House. The best hope to stop taking us back to a time where many Americans were one uninsured doctor’s visit from financial catastrophe is to keep pressure on our representatives. They need to know there will be a heavy political price to pay for taking away health care from the most vulnerable. Trump couldn’t party all night with his fellow Republicans since he had a meeting with the Australian Prime Minister. Trump kicked off that meeting by commenting, “We have a failing health care. I shouldn’t say this to our great gentleman, and my friend from Australia, because you have better health care than we do.” Australia has universal health care, the complete opposite of what Trump just celebrated passing. And so ended Thursday, May 4, 2017, also known as, the National Day of Prayer. In their prayers, Trump and the Republican party apparently didn’t make it to Matthew 5:5. In Trump’s America, the meek only inherit a pre-existing condition. Trump Not Omnipotent on Omnibus– The week began on a good note with the passage of a 5 month spending (“omnibus”) bill that wasn’t too far from status quo to keep the federal government open until September. Trump’s dream budget that would fund building a wall, kneecap the National Institute of Health’s funding, and strip mine the EPA’s budget did not come to fruition. 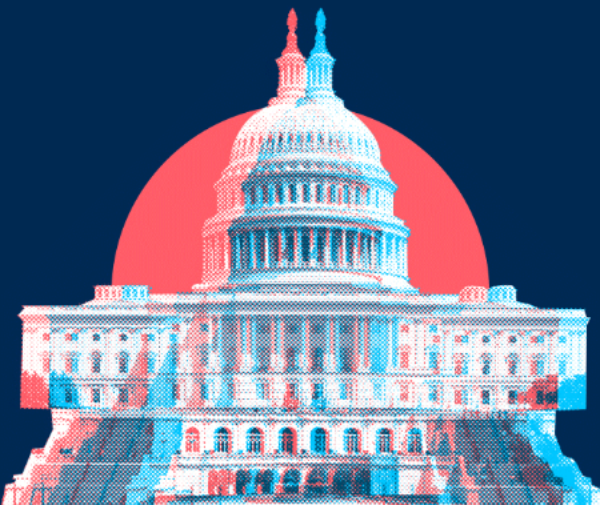 Major wins for Democrats included maintaining funding of Planned Parenthood, barring the use of border security funds for Trump’s wall, cutting the EPA budget by only 1% (rather than Trump’s proposed 31%), funding Puerto Rico’s Medicaid program, and allocating a total of $0 for Attorney General Sessions to fulfill his tangerine dream of going after medical marijuana laws. NIH even got a $2 billion increase! The Tears of a Clown – As you may recall, Attorney General Jefferson Beauregard Sessions III misled or perhaps omitted or just plain ol’ spun a yarn while under oath during his Senate confirmation hearings. There has now been a trial and a conviction based on that hearing. No, the perjurer Sessions wasn’t put on trial. Rather, Code Pink activist, sixty-one year-old Desiree Fairoz was convicted for disorderly and disruptive conduct for laughing during Sessions’s hearing. The Department of Justice went after Fairoz to impress their new boss, and she now faces a year in jail. Through my connections, I was able to getvideo of Sessions’s direct examination of Fairoz. You’re Not in the Army Now – For the second time, a Trump nominee for Army secretary has withdrawn. After anti-LGBTQ and Islamophobic comments came to light, Tennessee State Senator Mark Green retreated into darkness. Who Do You Have to Know Around Here . . . – Apparently, a U.S. Senator has the same channels to communicate with the administration as we do. Senator Bob Casey (D-PA) sent out several pleading tweets on Wednesday to twitter users, the Department of Homeland Security, Reince Priebus, and Donald Trump to intervene. Casey was trying to save a mother and her five-year-old son who were to be deported to Honduras. According to Casey, the two had witnessed a murder by a gang in Honduras, so deportation meant death. Further, Casey believed the child was eligible for special protection and that papers declaring as much were on the way. Unfortunately, DHS rushed their deportation before those papers arrived and sent them back to Honduras. There has been no news on their status since returning to Honduras. IRAte – The Senate passed a bill, 50-49, to make it much more difficult for states to help employees of small businesses save for retirement. About 50% of the workforce does not have access to workplace 401k programs to save for retirement. So the Obama administration approved a program to allow local governments (states and cities) to design Individual Retirement Account (IRA) offerings. The state-sponsored IRAs are managed by private companies and individuals can opt in. Wait, this sounds exactly like the GOP’s dream for health care. Why would they be against this? I’m beginning to get the feeling that the GOP’s only guiding philosophy is thou shall undo what Obama has done. This bill has already passed the House, so all that remains is Trump’s signature. As The Tяump Turns – Just a reminder that this chain of events occurred: In January, ultra-nationalist (and French election loser!) Marine Le Pen visited Trump Tower -> In March, Le Pen met with Putin in Moscow -> In April, Trump expressed support for Le Pen -> In May, Le Pen’s opponent Emmanuel Macron was the target of a massive email hack by the Russians. Enough to Make You Sick . . . or Rich – The Daily Beast reported that Representative Chris Collins (R-NY) purchased over $2 million of an Australian pharmaceutical company and then promptly pushed legislation to speed FDA approval of its drugs. Collins now owns $22 million in the company’s stock and his friends and family also own about another $20 million (or 30% of the company). You’ll never guess who was also in on this great pharmaceutical stock tip, Health and Human Services Secretary Tom Price – who is basically the Forrest Gump of health care investing, miraculously stumbling into one good deal after another. 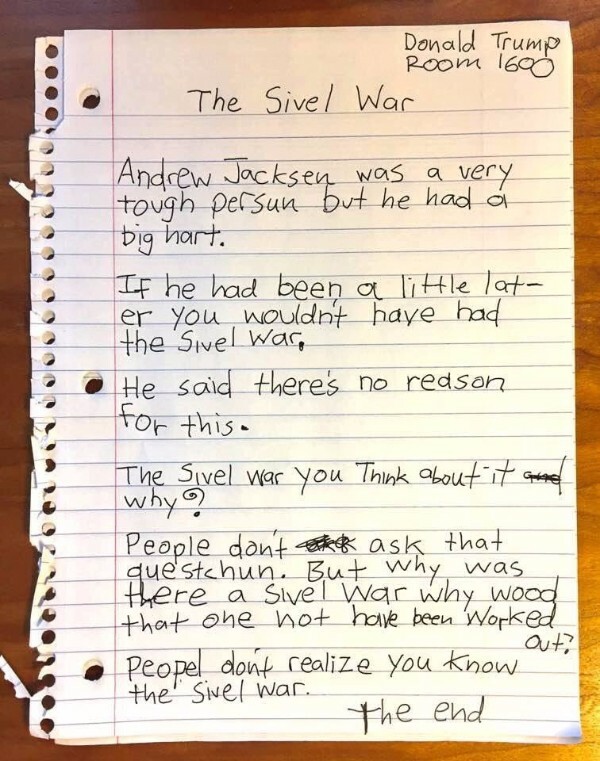 The above is Trump’s actual quote questioning why the North and South just couldn’t get along. There’s also a non-zero chance those are his actual notes. Donate to Swing Left’s special fund to target the 35 Republican representatives in swing districts that voted for RepubliCare. Give the morbid gift that lasts more than a lifetime. 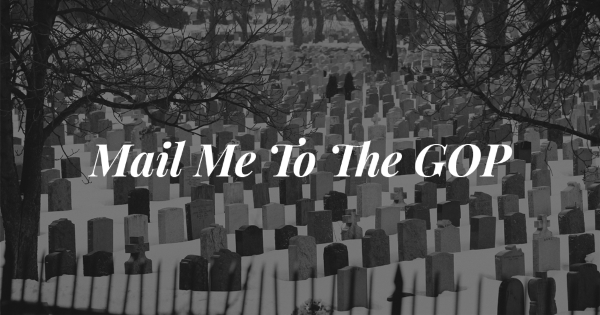 Mail Me to the GOP allows you to designate a Republican representative to mail your ashes to after you die from lack of insurance.